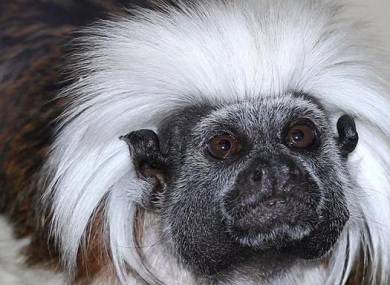 Unfortunately, the youngest tamarin was not found. FOUR OUT OF five of the monkeys which were stolen from Blackpool Zoo this week have been found safe and well. Unfortunately, the fifth creature – a baby tamarin – was not with the rescued group. In a statement on its Facebook page, the zoo confirmed that four of the five tamarins were recovered by police late last night. The animals’ keeper drove to a Yorkshire police station to collect them. The zoo thanked the public and media for “spreading the word so far and wide yesterday”. They also praised police and Wildlife Crime Unit “for all their hard work and support”. The monkeys were taken from the zoo overnight between Tuesday and Wednesday this week. The culprits cut a hole in the perimeter fence and approached two separate monkey enclosures. Locks were broken and the animals removed. Of the returned creatures, two are male Emperor tamarins and two are female cotton-top tamarins. The baby was also a cotton-top tamarin, which is a critically-endangered species. Police believe the animals were targeted specifically. “It would appear from the way that these thieves have broken into the zoo that this was a planned and pre-meditated crime and that the offenders knew what they were looking for and knew that the monkeys would be in the enclosures,” said PC Steve Higgs. Email “Four out of five stolen monkeys returned to Blackpool Zoo”. Feedback on “Four out of five stolen monkeys returned to Blackpool Zoo”.